These leafy plants are deep-green or almost purple in colour. These plants work as both indoor and outdoor plants. As an indoor plant, they grow depending on the size of the pot. If you prefer to keep your plant smaller, just keep your pot smaller. 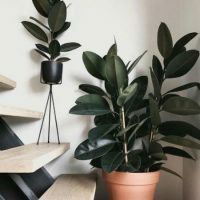 Some varieties of this plant can look quite similar to the fiddle-leaf fig, but these are much hardier – so this is a good option if you like the fig plant look without the fuss! These plants are great for supporting clean and comfortable air quality in the home. Care: Keep in a bright spot away from indirect sunlight. Water well once the top layers of the soil feel dry to the touch – maybe once a week in summer or twice a month in winter. Hard to kill? : As long as you don’t let this plant stand in a wet drip tray, it’s pretty darn hardy. 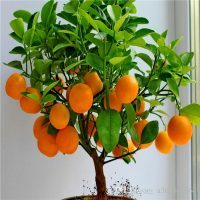 Orange Trees are relatively easy to grow indoors. If you choose a standard non-dwarf variety or grow one from seed – it could be years before you see any fruit. Specific dwarf varieties, such as Mandarin [not a true orange], calamondin and trovita, do well when grown inside as long as you maintain the basic temperature, soil, and light conditions. The keys to successfully grow oranges indoors are basically the same as with all citrus, good light, adequate temperature and humidity, well-drained potting soil, proper nutrients, and consistent moisture. Without any single one of those failure looms. Orange trees are generally container-grown and purchased online or from a local nursery. They can also be propagated at home from cuttings, and seed. If you decide to grow orange Trees from seeds, allow the seeds to dry out for up to two weeks. Once dried, plant the seeds about an inch deep in good potting soil and cover with plastic wrap. Once the seed has germinated it should be placed in a sunny location. Any container used for orange trees and any indoor fruit trees should provide ample drainage and room for growth. Any citrus started from seed will have a very long maturation period and a non dwarf tree will need to obtain substantial height before fruiting. 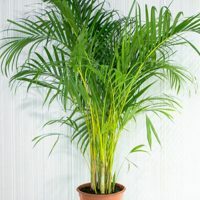 If you want to add a little Palm Springs flair to your living space, then a bamboo palm is the way to go. These plants can be large with long stems, perfect for resting on the floor, or you can get smaller table-top varieties that make great desk plants. In fact, given how well these filter the surrounding air, they are fantastic desk-top plants to bring into a shared office environment. The leaves have a voluminous almost fluffy quality and appear green and lively even in tough environments – they have an exceptional tolerance for low light. Care: Don’t keep in direct sun. Water 1 – 3 times a week, whatever is needed to keep the soil moist. Hard to kill? : These plants can tolerate almost anything except the roots standing in water. Make sure to empty the drip tray after watering. Monstera Deliciosa, Swiss Cheese, Split Leaf Philodendron, Mexican Breadfruit or Fruit Salad plant… whatever you call it, there’s no denying the popularity of this suburban favourite. 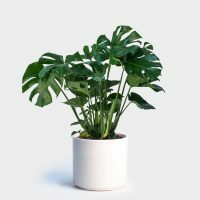 While some houseplants are content to grow in a small pot, Monsteras need room to move, so think big when deciding on a pot and where to position it in your home as they can be hard to move once established (unless you hire a helper on Airtasker, of course!). Hailing from the tropics, Monsteras love humidity, so will flourish. 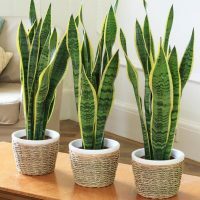 A popular decor choice in trendy cafes across the country, the eye-catching Mother In Law’s Tongue is a distant relative of asparagus (which explains the tall, shoot-like leaves) but please, try to resist the urge to serve it up with hollandaise on toast. Tough in appearance and durability, this breed is harder to kill than a bad guy in a horror film so don’t worry too much about over or under watering. Spider Plants are tolerant of a wide range of conditions & are adaptable & durable. They’re 1 of the easiest care houseplants around. Here’s what you need to know to care for & grow these fun hanging plants. Those long stems, with babies and flowers at the ends, just spray out any which way they want to! These hanging plants, with fleshy rhizomatic roots, need a bit of room to show off their arching displays. 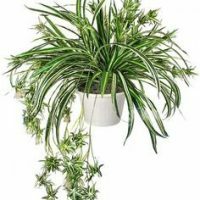 Spider Plants are one of the most easy-care houseplants around, are tolerant of a wide range of conditions, adaptable and durable as can be. Water: Low to average. Depending on how warm & bright your house is, this might be every 10-14 days. Water them when they’re almost dry & be sure to let the water drain all the way through the pot. If your water is high in salts, consider using distilled water. When I was a plant maintenance technician, I preferred to take hanging plants to a sink when the watering time came around. This took the guesswork out of when the water would come spilling out.